Created by writer/artist Mike Mignola in 1994, Hellboy is a character I would hear about here and there over the years, but even though '94 was one of the years when I was going to the nearest comic book store most frequently (until the place shut down) and a hero from Hell would be right up my alley (my all-time favorite hero is Ghost Rider, after all), I never did end up picking up a Hellboy comic. 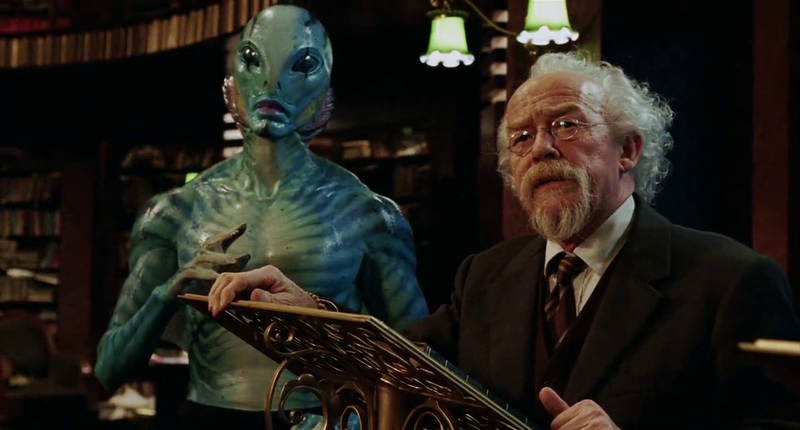 It wasn't until director Guillermo del Toro's 2004 cinematic adaptation was released that I was properly introduced to the character - and the way del Toro presented him made me quite fond of him. The Hellboy movie is apparently loosely based on the original comic book mini-series, but that's not something I can verify since I haven't read it. 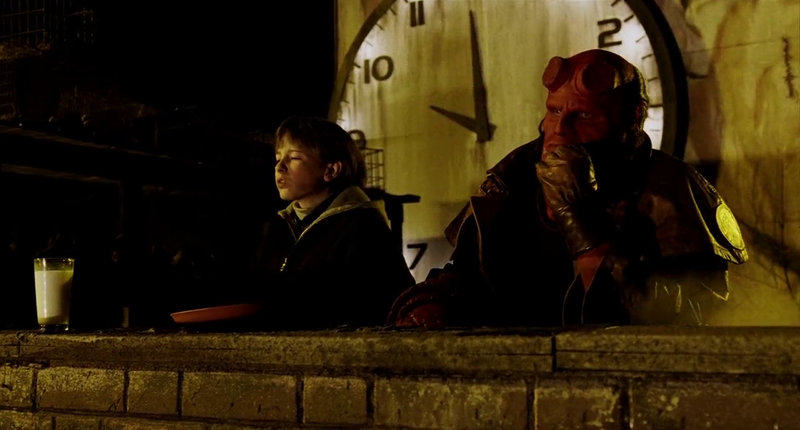 Del Toro wrote the screenplay himself and also receives a story credit, shared with Peter Briggs. Briggs was someone I was familiar with before Hellboy was released because he had written rejected drafts of two high profile crossovers I had been tracking the progress of. His versions of Freddy vs. Jason and Alien vs. Predator never did make it to the screen. When I saw his credit on Hellboy, I was glad for him that he was able to get something produced. The story of Hellboy begins during World War II. 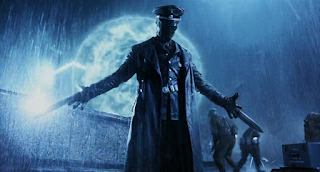 It's October 9th, 1944, and a narration by Professor Trevor "Broom" Bruttenholm (John Hurt) informs us that the Nazis were getting desperate at this point in the war, combining science and black magic in an attempt to gain the upper hand. Broom was serving as the paranormal advisor to President Roosevelt when he was part of a military mission to thwart the Nazis' evil schemes on an island off the coast of Scotland. On that island, the Nazis were attempting to open a dimension portal so they could free Lovecraftian creatures called the Ogdru Jahad, the Seven Gods of Chaos, from their crystal prison in deep space so these monstrous entities could reclaim Earth and destroy the heavens. Yeah... being willing to unleash Lovecraftian gods on the planet is a major sign of desperation. Leading this endeavor is Russian mystic Grigori Rasputin (Karel Roden), and that is the same Rasputin you've heard about from the history books. The one who was said to have been horrifically murdered around thirty years before this time. Rasputin's top lackeys are his girlfriend Ilsa Haupstein (Bridget Hodson) and the blade-wielding, masked Karl Ruprecht Kroenen (Ladislav Beran ), Hitler's top assassin and head of the Thule occult society. Rasputin and his pals think the Ogdru Jahad will bring about a new Eden, but I'm not sure how you can expect that from beings also called the Gods of Chaos. We obviously have a different idea of Eden. The Nazis manage to open a dimensional portal, but the American soldiers crash the party before they can call in their gods. 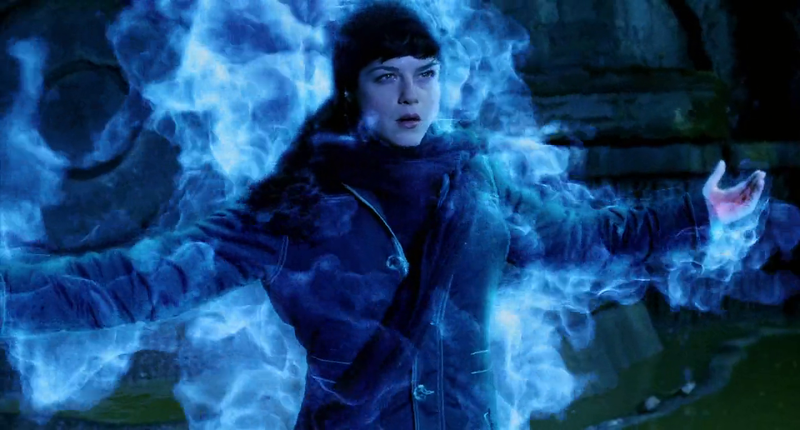 Kroenen appears to be killed, Ilsa escapes with a book of magic, and Rasputin is destroyed in the busted-up portal. The only thing that manages to come through that gateway while it's open is... Hellboy. At the time, he was a child and looked like an adorable little monkey. Albeit a hairless red monkey with horns and a large right hand made of rock. Broom raised Hellboy like his own son, keeping him fed (six times a day) and sheltered. As he continues to work with the government to deal with paranormal issues, Broom also brings his adopted son into the business with him. 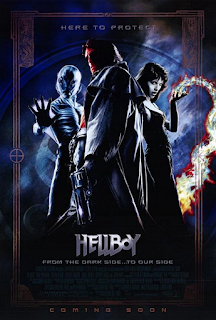 Hellboy becomes an agent of the Bureau for Paranormal Research and Defense, a branch of the FBI based out of a water treatment plant in New Jersey, and is sent on missions to fight any supernaturally powered monsters that might dare show themselves on Earth. He takes on the forces of evil with his superhuman strength and a gun he calls the Good Samaritan, loaded with bullets that are packed with holy water, clover leaves, silver shavings, and white oak. Being a demon, Hellboy ages differently than humans, and the sixty years that pass between the opening sequence and the main story only age Hellboy into his thirties. Meanwhile, Broom has become an eighty-eight year old man who is diagnosed with terminal cancer. Knowing that his time is short, Broom requests that the FBI transfer a new agent to the BPRD - a normal human fellow he can trust to watch over his unruly adopted son. 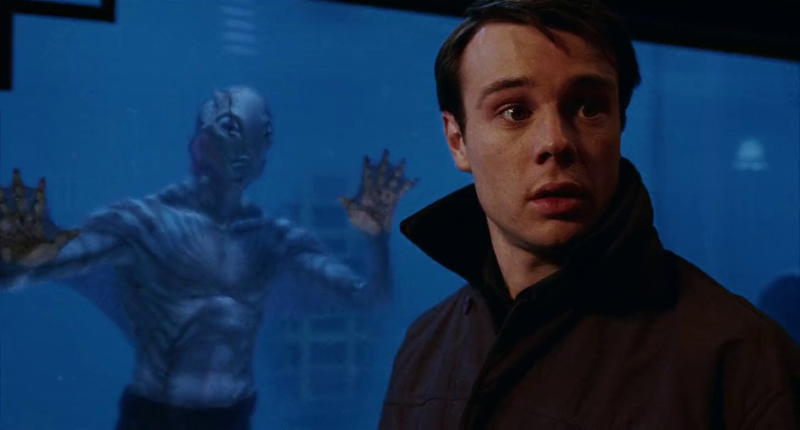 This new transfer is John Myers, played by Rupert Evans, and this character is sort of a concession del Toro had to make while putting together this movie - Myers is the audience stand-in. He's a blank slate good guy, and it's through his eyes that we're introduced to the strange world of Hellboy. We enter the BPRD HQ with him, and we meet Hellboy's fellow agent Abe Sapien (played by Doug Jones, voiced by David Hyde Pierce) - a Gillman-like creature who seems to have been born on April 14, 1865 and has psychic abilities - when Myers does. Myers also leads us to the modern day Hellboy, a 6'5" muscular badass who is very endearingly brought to life by Ron Perlman. 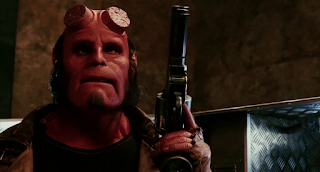 Since Perlman is the only Hellboy I've ever known, it's really because of him that I like the character, he is so perfect and entertaining in the role. When we meet Hellboy, he's feeling lovesick because a BPRD agent he has a major crush, the pyrokinetic Liz Sherman (Selma Blair) recently left the organization and is residing in a mental hospital, afraid of losing control of her firestarting abilities. Liz has left the BPRD several times before, and over the course of the film she is eventually coaxed back into action yet again. She also finds herself in a love triangle with Myers and the very jealous and immature Hellboy - he's been around for sixty years and is technically in his demon thirties, but he still acts like a teenager most of the time. 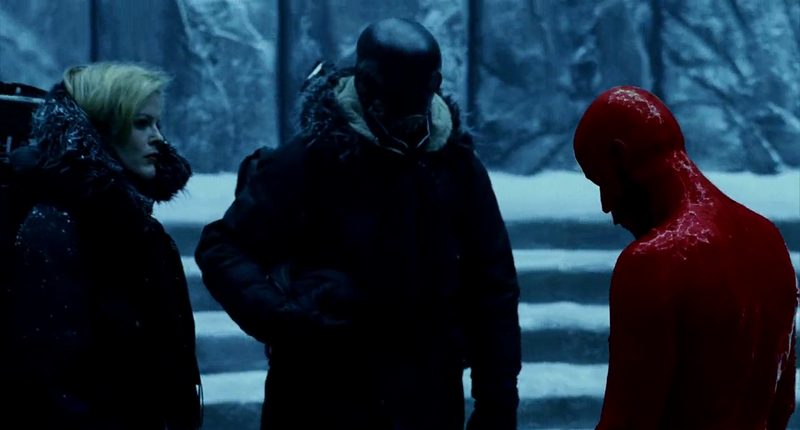 It's telling that the person he has the most level conversation with in the movie is a nine-year-old kid. The love triangle is a personal issue Hellboy has to work through while also saving the world from Rasputin, Ilsa, and Kroenen. Rasputin's magic was able to give Ilsa eternal life and youth, while Kroenen has kept himself alive by replacing body parts with machinery - like a wind-up heart. Rasputin has returned from the beyond just in time for an eclipse that will give him another chance at reaching the Ogdru Jahad, but to open another gateway he'll need Hellboy to embrace his true nature, give in to the evil lurking inside him, and start the apocalypse. 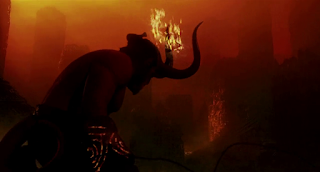 Hellboy wouldn't be much of a hero if he were to really do that, but it's a great dramatic aspect of the character that he does have this evil within. Even without completely turning to the dark side, Hellboy does have one rather horrific ability - he can raise people from the dead to gather information from them. This is revealed near the end of the film, when the villains have taken refuge in a system of tunnels beneath a cemetery in Russia. 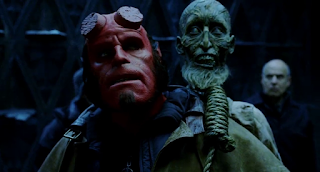 Hellboy pulls a rotten corpse out of its grave in this cemetery, brings it back to life, and carries the body on his back while it directs him toward these tunnels. I wasn't expecting anything like that when I watched this movie for the first time, but it put a smile on my face when it happened. The BPRD first becomes aware of Rasputin's new scheme when the undead mystic unleashes a monstrous creature called Sammael the Desolate One (or Lord of the Shadows, or Harbinger of Pestilence, or Seed of Destruction, or Hound of Resurrection). 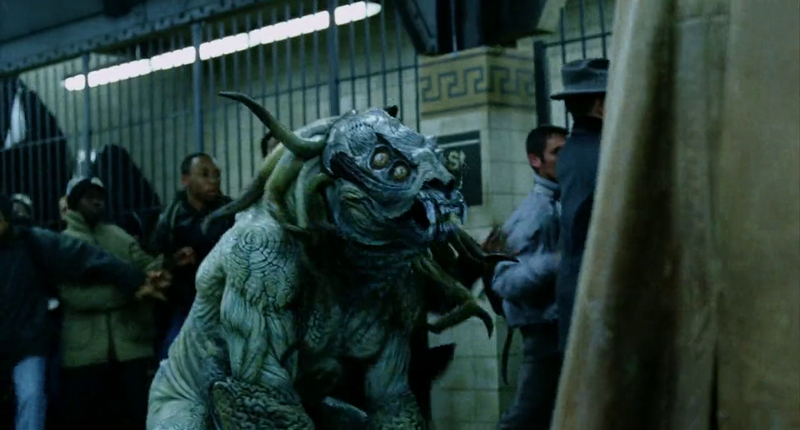 This beast has an interesting look, but I find that there is way too much Sammael in this movie. And too many Sammaels. It's called the Hound of Resurrection because every time one Sammael is killed, two will rise in its place. If you kill it, you're actually causing it to multiply. So that means Hellboy and his pals have to fight Sammael on multiple occasions throughout the film, and while there is some good action to be found in these fight sequences, Sammael isn't exactly an interesting opponent. It's just a monster with no personality. So you get to see Hellboy knock these things around, but after a while that sight means nothing. I'm more interested in seeing Hellboy take on the big three, but his battles with them are actually kind of lackluster. The only one he really gets to tussle with is Kroenen, and while Kroenen definitely is a worthy opponent, with his blades, immortality, and fighting skills, that fight ends too quickly for my taste. 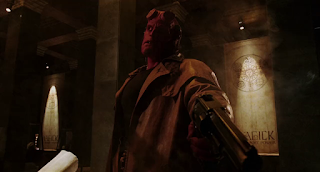 So the action in Hellboy is somewhat lacking and the Lovecraftian/Hellish elements may be too weird for fans of the average comic book film, but I still find the movie to be a lot of fun to watch. It's one I like to go back to every few years ago, mainly to revisit Hellboy himself. He's a cool guy to spend some time with. A guy who chows down on Baby Ruth chocolate bars, loves cats, and files down his horns so he'll fit in better. Never mind the red skin, tail, and rock hand.